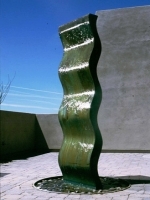 Water, clinging to the curved surface in the Desert Wave series, following the forms, seems to defy gravity, as if it would fly off any second, is always intriguing. 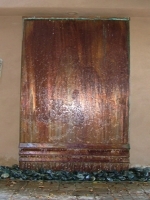 Add to the form the natural copper colors, be they green or varigated brown, and you have a piece of the Southwest heritage. 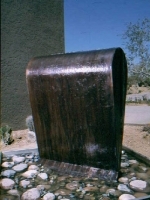 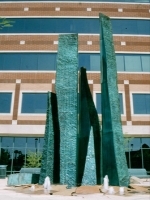 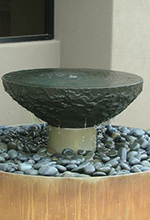 All of the Desert Wave series and other custom water features are produced in the Slater Contemporary Metal workshop. 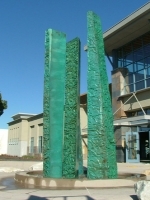 They have been an ongoing series for over 25 years. 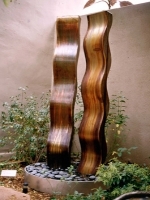 All “wave” sculpture water features are pure copper and can be ordered with a green or brown finish. 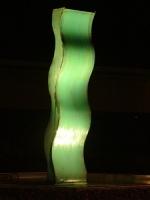 Brown finishes however will turn green over time. 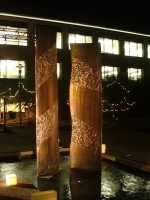 At night shows the beauty of copper with low voltage light. 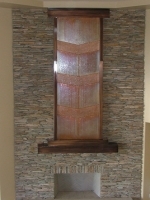 Four free standing copper columns with textured copper and smooth copper in this entry court is inviting. 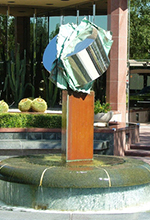 The copper upside down teardrop form lends itself to a modern environment. 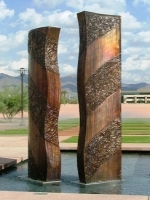 This sculpture is available in other sizes. 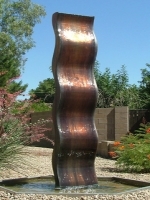 This simple copper form on edge is only 20 inches tall. 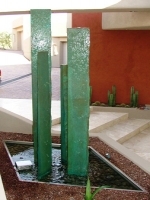 This interior water feature graces the entry of a home. 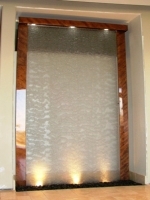 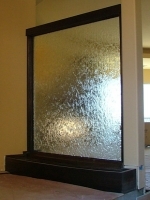 This built in water glass waterwall has water flowing down both sides, acting as a room divider. 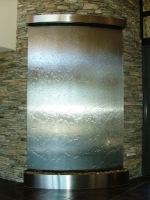 The stainless steel screen is a perfect vehicle for slowing the water and creating a wave effect as it trickles to the rocks below. 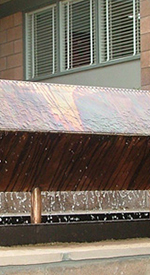 The angled bars at the bottom of the copper wall increase the activity of the water to create more sound.